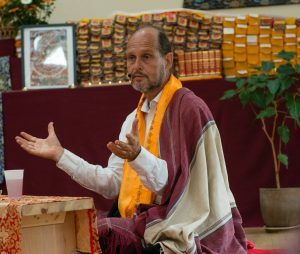 A special tradition has taken root at Gomde Denmark at Easter time: Erik Pema Kunsang’s annual meditation retreat for everyone – new and old meditators, Buddhists as well as non-Buddhists, Danes as well as English-speaking guests. The whole thing is a bit of a feast. Clear light of early northern spring. A sweet Dharma center and temple in Denmark’s most beautiful nature. Beaches, hills, forests, budding fruit gardens. A colorful assembly of dedicated participants. Not to forget, a musical kitchen team. At the heart of it all, Erik’s teachings that seem, paradoxically, to be moving backwards towards the more and more fundamental rather than forwards to something advanced. This year is no exception. The course description in Gomde’s official program goes “The first two steps on the path of meditation: 1) finding our inner seat, 2) making room in ourselves”. Elementary, right? Perhaps something you’ve been doing every day for decades, like me? And yet, paradoxically, the further back to basics these teachings move, the more depth emerges from in there. Not that every structure dissolves. There are teaching hours, meditation sequences and periods of silence all right – enough to be a bit of a challenge, in fact. But the beauty is that the direct, totally available, step-by-step itinerary of teachings and dialogues that makes everything more and more accessible to newcomers, year by year, also makes it more and more fascinating and groundb reaking to lifelong practitioners — who tend to make up half of the crowd – and to come back again. The more totally well-known, the more wildly new. I suspect this simple trick is exactly what makes these teachings surprisingly powerful and helpful: the ability and courage to go along with this paradox all the way. And then again, I suppose ultimately this can’t be a special signature of any teacher, time or place. This paradox – this weird topography or topology where every true step backward is a wild step ahead – has to be the shape of the landscape of dharma itself. Now just appearing in clear northern spring light. At one point I told Erik that something about his way of rendering dharma and meditation has this special bend or tilt or ring for me – cordial, easy-going, even playful – not solidly differing from other teachers but just making things a bit more organic. Being a philosopher I couldn’t help noticing a peculiar style of formulating and using a range of familiar Buddhist concepts – places where things become a bit less solid – a bit more processual, relational and immanent – in Erik’s formulations and approaches than anything I’d read or heard elsewhere. I gave him a few examples of that. Oh, he said – but I know exactly what that is – that’s just Tulku Urgyen’s touch. Tulku Urgyen – Erik’s teacher – as many of you will know he was a very special master in the Dzogchen tradition, famous for an ability to point students to the nature of mind, in a direct, easy-going, intuitive way. Unfortunately I never met him myself, but the after-image that I sense through many people who did, is one of great wisdom, so immersed and immanent in life that there is no need to look anywhere specific. As if hiding in the open clear sunlight. So, yes – I think that’s it: Erik is developing a mode of teaching, a special tonality that is “just Tulku Urgyen’s touch”. The touch of wild secrets hiding in the open. Beautiful description of the retreat. Enjoy the next one. Thanks, Phil. We surely will! I have not read the whole article, and for that I apologize. But to me this seems like a good way of stating something which comes to mind. I have been doing some meditation on healing-loving energies opening in sessions with a specific guy I know. 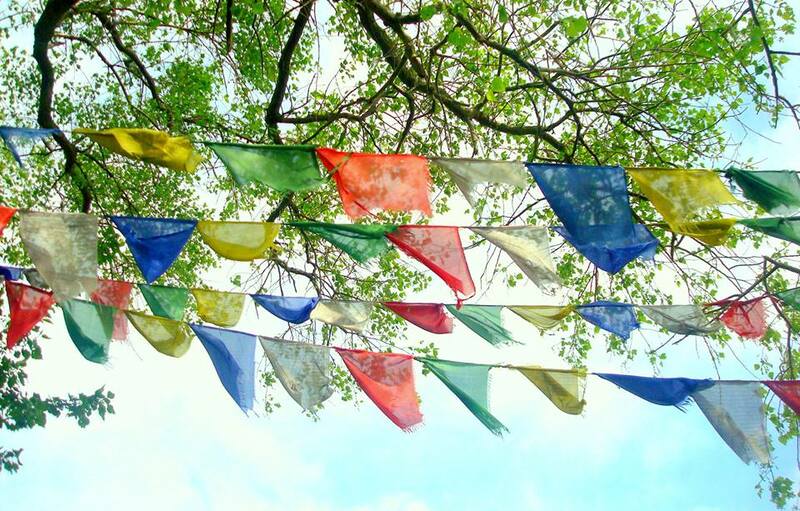 I have experienced deep touchings in the Buddhist communities and in the Buddhist traditions. I have been to several deep places of the past religious and traditional spiritual teachings. I have gotten a lot out of it. The thing for me at the moment seems to be a movement of recognition and thankfulness to this and these who practice and that have saved the old ways so good. I still believe that new, deeply transformative healing modalities and practices put regularly up these days, some more authentic than others, but nevertheless a serious contender, or rather a continuation of the older traditions of spiritual practice. What I am trying to convey here is my personal belief that there are new ways not belonging to older rooted traditions, or rather those spiritual energies that are a continuation of the past openings of spirit, that I tend to and want to open to. That is to say that I no longer believe in any salvation of any sort from older rooted traditions but rather seek out my individual path based on new spiritual openings free-taken from any bond of tradition. I hope that this can somehow give any resonance at all with some part of anyone that might have any connection to what I am writing. Dear Tarjei, welcome to Wisdom in Process. First I have to say that it is blatantly off to comment on an article without reading it and without trying to relate to its gist. I don’t know if the apology neutralizes the impoliteness and bad style of it — in any case, never mind that, politeness and good style is not what we are here for, but genuine co-explorative process. And in that respect, I just realized that the thing you are NOT doing here is so deeply interesting that your comment should stay posted although I was about to take it down in the moderation procedure for the obvious reasons. Listening. Becoming aware. Sensing what is alive in the situation. And then moving in it and with it, unfolding it, dancing with it. Which may then be in any mode or mood, from poetic pas-de-deux to competitive martial arts. This is totally essential in philosophy, perhaps it is THE only philosophical method, sometimes formally called “immanent critique”. And obviously, this listening, dialogic “method”, or way of being, is not confined to an academic field or a style of discourse, it is a very general mode of relating, and – I would argue – also really at the heart of contemplative and meditative processes. I will leave this point for now, “Philosophical Method” deserves its own blog entry and hopefully I will find the time and courage to write it soon. But this does connect strongly to Erik’s particular way of teaching that I tried to characterize in the article. 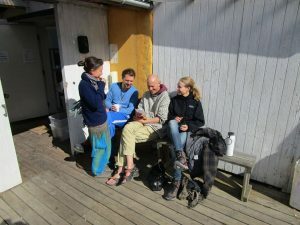 In exactly this sense – and not in the formal sense of academia – I would say Erik teaches in a very sensitive, philosophical manner. Your remarks about traditions, and being in and out of them, also point to something of importance for many who try to have a spiritual practice or process on board in life, in a time where traditions are very generally moving, breaking, colliding or transforming. It is a very rich problematic and we can’t do justice to it in a few sentences, but while I think I agree with you that simple direct copying of traditional modalities of spiritual practices and relationships into contemporary settings is not always sufficient or desirable, it would also be very inadequate to “start all over” so to speak, as if our reality was not full of historical threads and resonances, some of them rich in spiritual and philosophical depths and potentialities – for us to listen into and realize in new ways. Also, in my experience, the attempt to be “beyond traditions” can sometimes lead to the opposite – being caught in traditional frameworks that one cannot see and be free with, because they are no longer alive for one. I think this is true for our modern Western concept of time, for example – the Christian almighty creator God sits heavily on it, exactly because we try to be beyond that tradition, as I think I have clearly shown in this article. But yes, being soft, creative and free around spiritual heritage is definitely a good thing, and of course all the great spiritual traditions have themselves been shaped out of qualified openness and creativity. Again, I think this has an interesting connection to Erik’s style – relatively traditional and orthodox on the face of things – but just because he has listened so incredibly deeply into the Dzogchen and Vajrayana tradition with so much of his life, he is able to convey it in forms much more free and open and alive than …. Or in fact, I don’t really want to do this in a comparative mode , implicitly at the cost of others, so let’s just say: in forms that are strikingly free, open and alive. This brings up a vast field of questions, inquiries et cetera that could have been made into a lot of commentary from both sides, Niels Viggo. First of all it is really good that we write to each other out of respect that I sense in both your respond to my first, probably not the most thought through comment of all time, and in your respond answer. I sense it from both of us. That is the most important for me. Because without this thoroughly respectful manner of discourse there could not be any true conversation or expoloration, as I presume was and is your intent. I do however want to state a couple of things. The first is this conversational style in which we are writing. That is to say philosophical-tradionally wise, or just somehow old fashion. Because in these days of instant internet access to popular social media this becomes more of a written conversation where there exists time to meticulously paint out a broader scope of our mind’s nature and content. I want to start off by saying that I do believe in the old traditions. Believing in the sense of honoring them as such. That is to further state that believing and honoring them is not the same as to follow. What is it to follow a religious or group spiritual tradition anyway? Now I would like to explain it in further words. It is my conviction that I know myself only partially. So do most of you who are reading this. Or you may understand who you truly are. That is not up to me to judge. But I do know that I do not know to which extent I am fully aware of who I am. To state it like that. But one thing I do know is in that I exist in relation to Other. Existing in relation to what? Existing in relation in this case to tradional teachings of spiritual tradition. I enjoy seeing myself in a new light, as I tried to state in my previous comment. I do however understand – after reading the whole article about Eric’s teaching – that this “new” is somehow off the point. Because maybe that is my main point. I truly believe in knowing yourself. It is as, again stated, I see myself and understand myself as someone “new” in relation to the wisdom traditions of the East. This is extremely important for me to state because I feel it, I sense it in my very heart. I do not even know if the word “new” is correct. It might even be more correct using the word “different”. I am in the process of discovering what it all means. In the meanwhile I have to leave it up to generous and kindhearted people like Niels Viggo to reflect back on what I am coming forth with. If this gives any meaningful insight into the nature of this dialogue, I thank you for your greatful attention and wish for the best day onward wherever you may be. Yes, there is a dialectic of newness and roots. To be genuinely new and fresh is to express in a new form of meaningful way the truth of what was already there. Simply coming up with an unseen arrangement of bits and pieces, like lkcvievwhpvibhqt4vsuf – which almost certainly has never been written before – misses the old as well as the new. And yes, we exist in relation – or even by virtue of relation – to people as well as histories. Again, I suppose these truths can be brought to bear on the topic here, teaching style. But I think I have already – with your paradoxical help, Tarjei 🙂 – pointed to the central heart string by which they get involved there: the teacher’s deep listening.